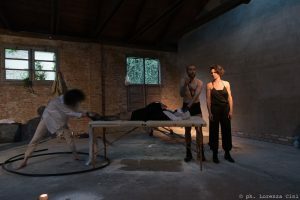 The legendary performance troupe La Pocha Nostra (US/Mexico) and artist duo VestAndPage (Germany/Italy) have chosen to merge their unique pedagogical practices and announce a joint immersive performance class as part of the ART WEEK | Workshop Series. With this project, they will inaugurate a brand-new pedagogical campus at C32performingartsworkspace in Venice, Italy, situated in the heart of Parco del Contemporaneo at Forte Marghera, a historical park facing the western bank of the Venice lagoon. „On our world’s stage, where economic and social systems move deeply into relations of the capital, La Pocha Nostra’s and VestAndPage’s generous theory and practice stress the complexity of being human – the pleasures and the pains. Before knowing you I was wondering what motivates artists to give, to share initiatory processes.To me, you have been the experience that embodies what art can do: assigning sacred tasks to the human imaginary, you showed me that I might be able to live my life as a work of art. I understand that efforts are required, as well as sacrifice – but everybody has his part on the stage.“ Francesca Carol Rolla (Coordinator of the ART WEEK | WORKSHOP SERIES) on her motivations to organise.